Today over at the JustRite blog, we are previewing one of the many fabulous new stamps that JustRite Cling stamps have come out with and this gorgeous stamp set that we are previewing today is called: Kindness. It comes with such gorgeous gorgeous gorgeous frames that coordinates with the newest Spellbinders that are still yet to be released (but have been previewed). Accessories: ribbon from stash, flower from Prima, liquid pearls, dimensionals, nesties, MS butterfly punch and bling. I just love the details on this! The colors & that frame are amazing! Sankari, this is dazzling!! So much texture and detail!! Truly amazing! I love this! It is stunning. Love how you embossed this, makes look so rich. Stunning, Sankari! Love how you layered these gorgeous labels! very detailed Royal and well done! Gold is my Fav! Oh, my -- this is outstanding Sankari goodness here! Love all the pearly accents! Very pretty. Love the detailing with the liquid pearls. Maybe you could do a quick tutorial on how to do this. 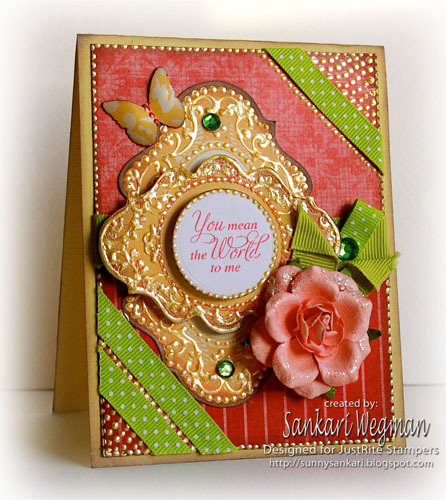 Beautiful work Sankari. This is gorgeous.